I’m very excited to have had my first column published in the August 2015 issue of Banjo Newsletter. You can see a transcript of it below, including my boogie exercises and transcription of the iconic Professor Longhair song, “Tipatina.” See the Youtube video below for a demo of everything mentioned therein, and the full transcriptions at the bottom (click on the images to view them larger). Happy picking! I’ve always loved the blues and jazz music that has come out of New Orleans. As in bluegrass, the great instrumentalists have a seemingly endless vocabulary of musical ideas to play over predominantly simple I-IV-V chord progressions (with some variations thrown in, of course). The piano playing in particular always stood out to me for it’s ability to seamlessly weave between chordal and melodic playing, much like a banjo does in bluegrass music. And so while I delved into Scruggs and melodic style banjo, I always kept those ideas in mind. But as I continued to seek out new influences and inspiration on the instrument and discovered the likes of Pat Cloud and Ryan Cavanaugh playing bebop horn lines and Bela Fleck arranging cello suites, I realized the extent to which you could draw on other instruments to inform your playing and I began to work on adapting that piano music more literally to the banjo. By working through pieces by some of the greats in New Orleans and especially boogie woogie piano music – Professor Longhair, Dr. John, Albert Ammons, Pete Johnson, I developed a foundation of licks and rhythmic patterns that could be used in a wide variety of settings. The quick triplets, or “trills” as they’re often referred to on piano, that are so predominant in New Orleans and boogie-woogie piano particularly reminded me of the type of triplet passages that are so conducive to three finger technique. Much of the common chordal movement from those styles sits really nicely on the banjo too as we’ll see. Not only are they ideal to play over blues and boogies, but they’re great for injecting some variety in to more bluegrass and traditional styles as well. Keep in mind that I’ve focused primarily on the right hand of these piano parts, although there are plenty of great passages to be learned by checking out the left hand as well. It’s incredibly humbling to realize that for all the work that went into arranging these parts, I was really only covering half the ground of the great players! But that’s the beauty of playing in an ensemble, and it’s been a great thrill to bring these ideas to my band Roosevelt Dime and have the bass or guitar pick up those left hand bass parts. 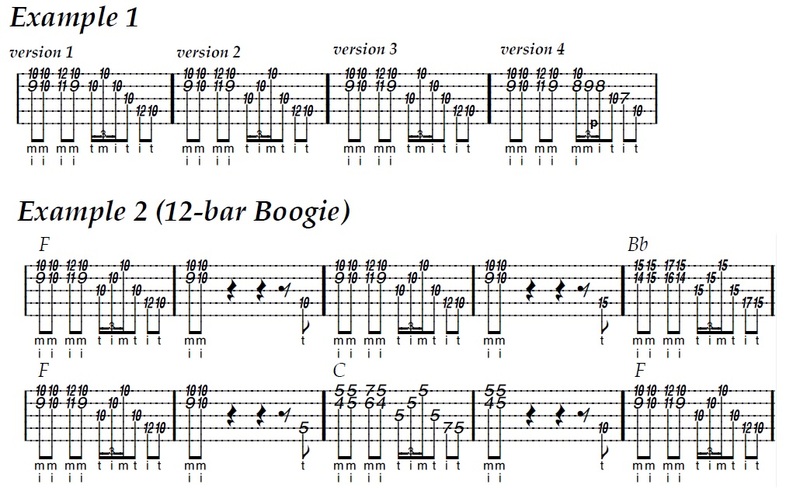 Example 1 shows a very typical boogie piano lick featuring double stops and a triplet pattern that fit nicely out of a basic barred position that works all over the fretboard, and can be used over any of the I-IV-V chords of a blues. In this case it’s based around a bar chord on the 10th fret in the key of F, and I’ve included four different ways to play that triplet passage- the first one shows how it would most commonly be played on the piano and is the trickiest, as it involves starting the roll with your thumb on the second string and then playing a backwards roll; the second uses a forward roll; the third a backwards roll; and the fourth is a slight variation in the arpeggio itself where the triplet is achieved with a hammer-on and pull-off as opposed to each note being picked. Example 2 shows how to turn that lick into a simple 12-bar boogie by simply moving it up or down the neck for each of the I-IV-V chords (in this case we used the forward roll version of the triplet). Next, we can look at Example 3, which shows an arrangement of the Professor Longhair song “Tipatina.” It features some nice double stops on the 1st and 2nd strings against a pedal tone on the fourth string that I play by keeping my pinky on the first string, hammering from my middle to ring finger on the second string, and then bringing my middle finger down to the fourth string. You’ll also notice slight variations of previously discussed lick played over the IV chord (measure 3) and I chord (measure 5). The resolution to the I chord going from measure 6 to measure 7 is a great commonly played lick; I like to bar with my index finger across the sixth fret, and use my pinky on the 8th fret and then hammer on to the 7th fret with my middle finger. This entry was posted in New Orleans / Boogie Woogie, Transcriptions, Video and tagged banjo, banjo newsletter, blues, boogie, boogie woogie, deering banjo, piano, Professor Longhair, Roosevelt Dime, Tipatina on August 9, 2015 by greendrew.